Calypso villa is gorgeous, and you’ll probably be spending much of your time outdoors. Great ocean views, a private swim dock, and snorkeling are all right outside your door! The villa has direct ocean access and a private pool, and is a short walk from nearby tennis courts. 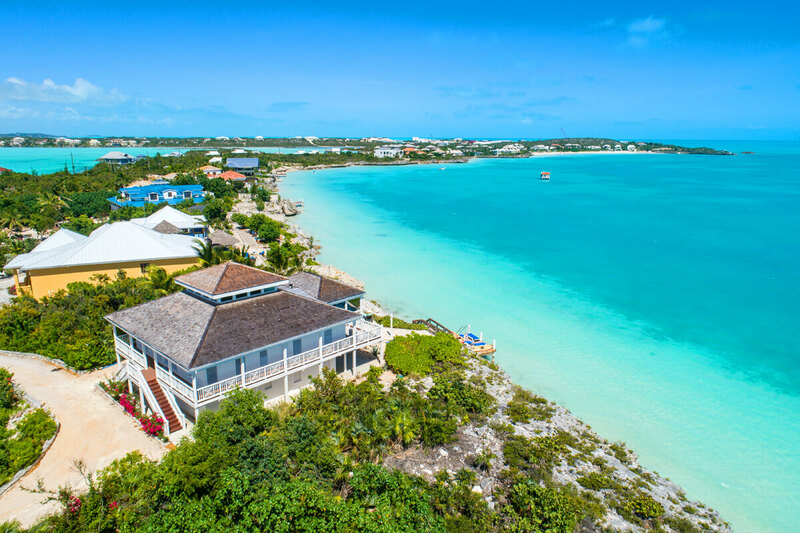 Whether you want to spend your vacation kicking back and relaxing or being active all the time, Calypso is a great home base for your trip to Turks and Caicos. Calypso villa is spacious, welcoming, and directly overlooks Sapodilla Bay. This oceanfront villa is in the Ocean Point area of Providenciales, and has an open floor plan. Calypso has its own private swimming dock below the bluff and two kayaks to take out on the turquoise waves. The villa’s pool is well-sized for swimming laps and sits along the edge of a stone patio. There are loungers under the palm trees and chairs under the veranda so guests can relax in the sun or shade. There’s also a BBQ grill under the gazebo. Inside, nautical accents decorate the Great Room. The dining table is closest to the screened porch and the kitchen sits adjacent. Stainless steel appliances, a wine cooler, coffeemaker, and a breakfast bar furnish the kitchen. In the living room, guests can relax around the flatscreen TV or play board games on the coffee table. Upstairs on the screened porch, vaulted ceilings shade the living and dining area. The villa’s five bedrooms each have an ensuite bathroom and air-conditioning. Three bedrooms are on the main level, and two are on the pool level. On the pool level, there’s two king suites with TVs. On the main level, there’s a king suite, queen suite, and a third bedroom with two twin beds. Take a short walk across the street to tennis courts and Taylor Bay’s shallow, calm water and powder soft white sand. Calypso is located between Sapodilla Bay and Chalk Sound, and is a short drive from restaurants and activities. Rates do not include: tax of 12%, damage waiver fee of $99.00. Upon arrival guests will be met at the airport by a member of the villa management team. After securing their rental vehicle/taxi the guests will follow them back to the villa. A/C usage overage; Car rental, private chef, butler, server, daily maid service, grocery and beverage shopping (pre-arrival and during your stay), liquor and wine delivery, nanny service, baby equipment, spa services, yoga and personal training, photography, and private airport transfer/car service can be arranged for an additional fee.